My Life and Activities here in KSA..: Red Wine..Truly the Best!! 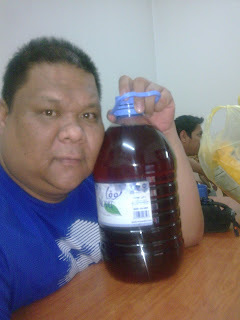 I could not imagined that a friend of mine,has a friend who is making redwine.They said it was filter and made into pure redwine for 4 months.First, I am hesitant to drink,since I was drunk for 6 straight days,but because my friend invited me to drink the redwine, I drink..At first,I say I will only taste the redwine,but I don't know why I began to like the redwine..This 5 Liters was consumed the whole night with the three of us,ending our session at 2 am,with still work at 6am..Anyway,I hope my friend will come and bring with the same wine.It was very good and I think I love redwine..No hang-over,no headache.Good for the body and especially for the heart.Love it guys! !